Essential plot rundown: A group of college kids spend a weekend at an abandoned cabin, where, unbeknownst to them, they are being watched. This was filmed back in 2009 but was barely released this year. 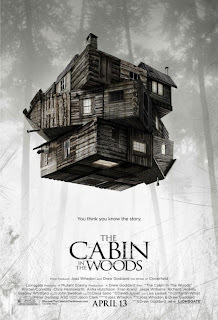 And I am glad they finally released it because A Cabin in the Woods was a lot of fun. The story was well written. Joss Whedon co-wrote it and from I understand, he's really good. (I'm familiar enough with his work to have an opinion). It pokes fun at, acknowledges, plays on, however you want to describe it traditional horror movie conventions. Essentially, it explains why horror movies happen as they do. It had the right balance of scares and laughs. The dialogue was good too. (Unlike that sentence). But, as I was watching it, how things were set me reminded me a little of The Hunger Games. The acting was good for the most part. There were some times the college kids' performance was subpar. (But, then again, maybe that was one of the conventions they were referencing). But I thought the people in the control room did a really good job. And it had Bradley Whitford in it, which I personally liked, seeing that I only know him for his role in Billy Madison. But, overall, this was a really good movie. I laughed out loud a lot. You know those movies that are so funny that you bounce up and down in your seat, lean forward and cover your mouth, etc? Yea, this was one of those. And it had an appropriate amount of scares. It was a good time at the theater. Now, I feel like I should watch more horror movies so I can pick up on all the references.